A spokeswoman for the company that owns Hardee’s and Carl’s Jr., confirmed today that they hope to have the first Carl’s Jr. in Idaho Falls open by New Year’s Day. “Our opening date has been shifting, but one should be opening by the end of this month,” said Kelly Grieve of CKE Enterprises, Inc.
Look at that juicy Carl's Jr. Burger. There are two Carl’s Jr. locations planned for Idaho Falls, one on 17th Street, where Schlotsky’s Deli used to be, and the other at the corner of North Holmes and Yellowstone Avenue, near Wendy’s. Judging by the progress at both sites (the North Holmes restaurant is being built from the ground up), it’s safe to predict that the 17th Street location will open first. 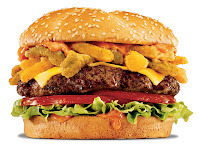 Carl's Jr. has 11 locations in Idaho, most of them in the Boise area, the nearest one in Twin Falls. Its corporate office is located in Carpenteria, Calif. The chain dates back to 1941, when Carl N. Karcher and his wife, Margaret, borrowed $311 on their Plymouth and added their $15 in savings to buy a hot dog cart. 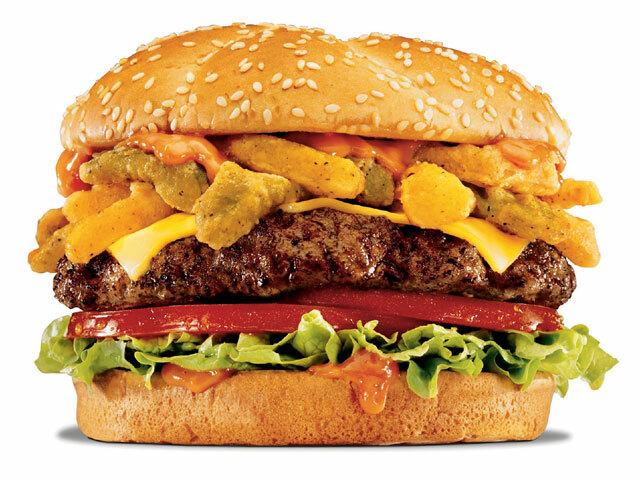 Today, there are more than 1,200 Carl's Jr. restaurants, most in the West and Southwest.